The entire pumpkin experience is one of our family’s favorite Halloween traditions. Hands down, nothing beats a bag full from a night spent trick-or-treating, or getting dressed up in costume and playing the part. In that order, running in third place is the pumpkins. Going to the pumpking patch is an event in itself. We went to Green Bluff this year to experience not only picking the biggest and freshest pumpkins we’ve ever had, but we also experienced the pumpkin cannon. Bringing home six pumpkins weighing in at 138 pounds, we could have made an entire pumpkin person from our over zealous adventure. Instead we stayed true to form and carved our jack o’ lanterns. At least, that was the plan. This year I bought a keyhole saw. I read a Martha Stewart Facebook post that said she found keyhole saws to be the best pumpkin carving tool, aside from her entire pumpkin carving kit. I went to Home Depot and sought help from the first orange apron I encountered in the tool section. The orange apron showed me to the saw section and asked what project I was working on. As tempted as I was to say that I wanted to cut a keyhole, I refrained and confessed my Martha Stewart pumpkin project. He showed me the different options available and went on his way. Back at home, my husband and I pulled the dining chairs away from the table (standing room only), lined the dining room table with towels, a flannel backed vinyl table cloth and plenty of newspapers. Then I called in my muscle men to carry in their pumpkins. 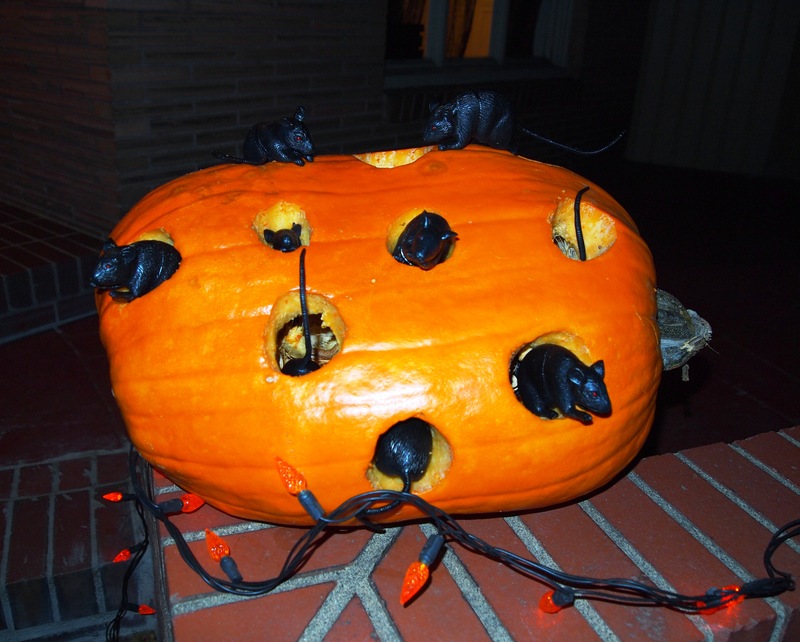 Our two older boys refused to participate unless someone agreed to scoop out the insides, the pumpkin guts, because the smell makes both of them gag. Before I could volunteer, our youngest signed up to be the official Pumpkin Gut Cleaner. My husband and I looked at each other with “this ought to be good” looks as our youngest notoriously bails the scene when the real work begins. Our youngest did need a step stool but they all got busy. I love this picture. Three boys with knives and saws, fantastic. 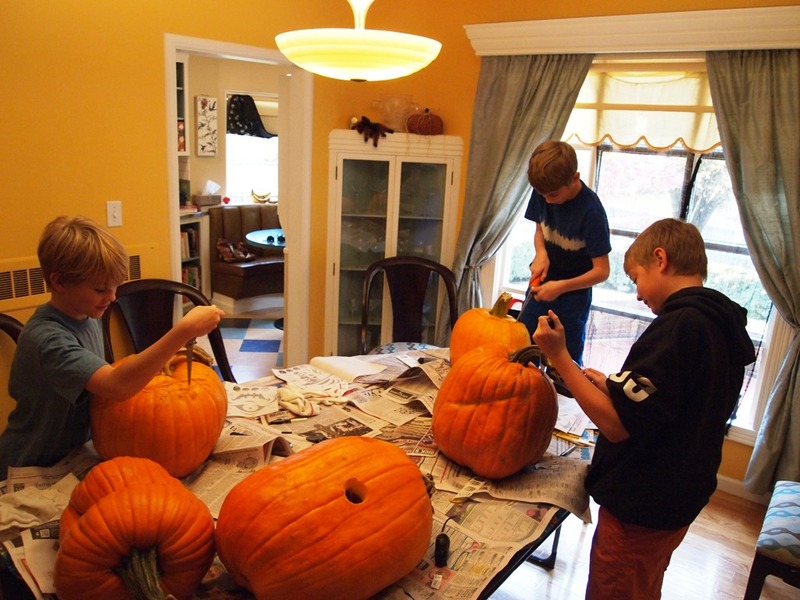 As soon as the older boys cut out the tops, our youngest jumped right to task and cleaned out four pumpkins! We were all stunned. The gooeier the better. He loved playing in the muck. Our middle son was the only one to carve two pumpkins. One free form, working with the odd shape to create his “old man” pumpkin. The second, like his brothers, was carved using stencils. I, from the same Martha Stewart Facebook post, made a Mouse Motel. Let me tell you, a keyhole saw is a must have for pumpkin carving. Fast, smooth, easy circles and clean lines. How have I lived this long without one? My husband was in charge of safety and assistance. He did a great job. Here is our final products. 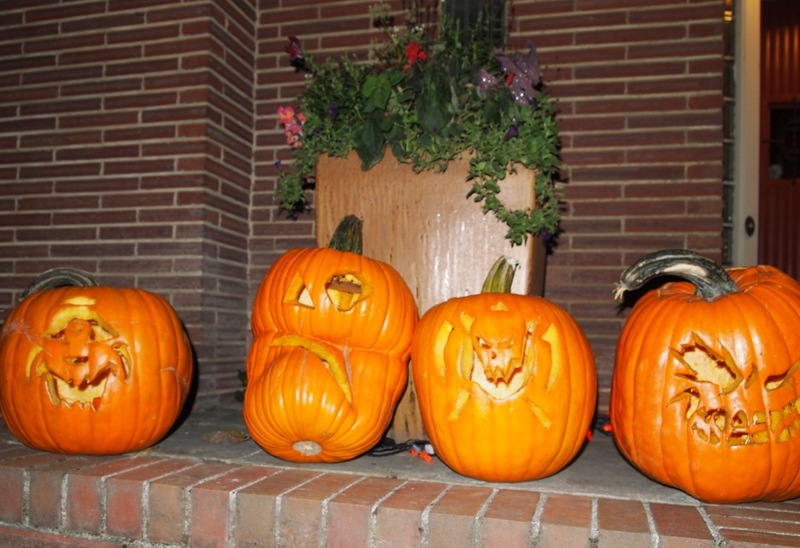 On the left are the two our nine-year-old carved. Second from the right is our eight year olds handiwork and on the right is the work of our twelve-year-old. We did bring six pumpkins home. One is small, uncarved and cute. We decided to leave this one alone. Do you have your pumpkins carved?